Do not use insulting, aggressive, or provocative language. If you feel another forum user is using insulting language, seek to calm things down, or if that fails, report the matter to the moderators. Under no circumstances should you seek to trade insults, or make accusatory remarks to that, or any other, forum user. Show respect to other forum users. In particular, there are times when forum users might post about delicate personal issues. Please refrain from trivialising or making inappropriate remarks, or remarks that might embarrass the poster. This has been explained. You may disagree so then agree to disagree. By accusing someone of being evasive you appear to be trying to foster the impression of dishonesty on the part of another member. I hope you will apologise for this slight. If not shame on you. There is no universal rule that a wavefront's speed depends only on the medium and not on the initiator, however, as we explained it does occur with some media in some situations. Its just that I have not seen it written anywhere, nor can I imagine how physcially, where it is suggested that the speed of a wave is not dependent on its medium's properties. This is why I found it be rather illuminating. It seems this media, the forum, is too simple a method to convey every nuanced meaning. After all, this is just basic texting back and forth, so not all can be explained at the same time. If I was to put it another way, is that its directed at the way that physics is taught in general these days, and not at Colin2B. So, my statement would still hold: that the way it is explained, or taught, or whatever, is one way to evade the core issue. The core issue being: that the speed of sound is solely dependent on the properties of the medium, and not on the speed of the originator. If that isn't clear enough, I am not sure how else to explain it. No. The speed of sound changes depending on the density of the air. The speed of light in a vacuum never changes. Interesting to note that when light passes through a medium such as water it's speed also changes with density - mainly due to temperature. "Einstein talked about the speed of light changing in his new theory. In the English translation of his 1920 book "Relativity: the special and general theory" he wrote: "according to the general theory of relativity, the law of the constancy of the velocity [Einstein clearly means speed here, since velocity (a vector) is not in keeping with the rest of his sentence] of light in vacuo, which constitutes one of the two fundamental assumptions in the special theory of relativity [...] cannot claim any unlimited validity. A curvature of rays of light can only take place when the velocity [speed] of propagation of light varies with position." This difference in speeds is precisely that referred to above by ceiling and floor observers." We measure the local speed of light to be constant because we use the local motion of light to define our second and our metre, which we then use to measure the local speed of light. Hence it's a tautology. Magueijo and Moffat talked about it in http://arxiv.org/abs/0705.4507. Just about everything you say John is a myth. You may ocassionally and accidentally get somethinfg right by copying and pasting the right source material. You are helping no one learn physics the right way. People should be aware of that. Don't try pushing your own agenda. No, what I say isn't a myth, because Einstein and others said it, and because what they said is supported by the hard scientific evidence of for example the Shapiro delay. I'm afraid what you believe is the myth, promoted by popscience magazines and TV programs and other sources. It's these sources that aren't helping people to learn physics the right way. Although we would all agree that the speed of light is not constant in all situations, this topic is more concerned with attempts to misrepresent the propagation of waves in a medium and draw incorrect conclusions regarding the behaviour of light. Similar misunderstandings regarding the speed of sound in air has been dealt with above, along with the myth that the speed of waves in a medium is independent of the motion of the observer through the medium or of motion of the medium relative to the observer. All of this misdirection is intended to 'prove' that light travels in a medium. Personally I don't care if it does or not, so long as the physics is not not misrepresented. Where in any of that did the word vacuum appear? The coordinate speed of light is something you are using incorrectly without mentioning any frame of reference for the benefit of the reader. That is deceitful. You are only giving the information that you hope will sway readers in your direction of thought. Don't go quoting sources at me. Prove it yourself. I'm all ears. The behaviour of light is an interesting topic. There's some contradiction there. And surely everybody can look this sort of thing up, on for example Rod Nave's hyperphysics? That's true for light too. See the Baez article: "That the speed of light depends on position when measured by a non-inertial observer is a fact routinely used by laser gyroscopes that form the core of some inertial navigation systems. These gyroscopes send light around a closed loop, and if the loop rotates, an observer riding on the loop will measure light to travel more slowly when it traverses the loop in one direction than when it traverses the loop in the opposite direction. This is known as the Sagnac Effect..."
All of this misdirection is intended to 'prove' that light travels in a medium. Personally I don't care if it does or not, so long as the physics is not misrepresented. Imagine your left hand working the frets changing the wavelength, whilst your right hands plucks a constant pluck with your plectrum. A constant pluck. Look at the picture above again. The depicted amplitude is always the same regardless of wavelength. surely everybody can look this sort of thing up, on for example Rod Nave's hyperphysics? Oh how I wish everyone as as diligent as you before posting a new theory. I have a feeling many invent a theory and then twist what little they know to fit! My pleasure Colin. For myself, I wish somebody would do something about the unpleasantness from certain forum members. So asking you to answer a physics question needs moderation. Last time I checked it was still a physics forum. You portray youself as some sort of authority. This means that people may think that you are a source of legitimate answers. People not conversant with physics have no way of telling if the information they receive is reliable or not. You are basically stating that a lot of mainstream physics is pop science mythology. I think that deserves to be challenged lest the uninitiated be led astray. If you would just answer the question you could prove me wrong immediately. Anyone familiar with the metric would do so immediately. If you want people to believe in you then show them. The longer you put it off the worse it looks. So asking you to answer a physics question needs moderation. Last time I checked it was still a physics forum. You portray youself as some sort of authority. Note "the speed of light is spatially variable" and "the speed of a light wave depends on the strength of the gravitational potential". Also see Is The Speed of Light Everywhere the Same? and http://arxiv.org/abs/0705.4507 where Magueijo and Moffat referred to the tautology: we define our second and our metre using the local motion of light, and then use them to measure the local motion of light. This means that people may think that you are a source of legitimate answers. People not conversant with physics have no way of telling if the information they receive is reliable or not. Yes they do. They can follow the references above and read up on what Einstein and others said. You are basically stating that a lot of mainstream physics is pop science mythology. I think that deserves to be challenged lest the uninitiated be led astray. No, I'm saying you're claiming to be talking mainstream physics when in truth you're peddling cargo-cult trash. If you would just answer the question you could prove me wrong immediately. Anyone familiar with the metric would do so immediately. If you want people to believe in you then show them. The longer you put it off the worse it looks. What question? Something obscure, like why is k is not treated as complex in the FLRW metric? Where I'll give the right answer and you'll claim it's wrong? No thanks. I'll stay on topic instead, and talk physics in my usual civil fashion. If you prefer to play the troll and chase posters away with your sneering dishonest abuse, that's your choice. Well deflected John now you have given yourself the excuse not to answer. Well done. A stroke of genius. People not conversant with physics have no way of telling if the information they receive is reliable or not. This point is worth noting because this site is primarily educational and we get people of all levels reading these pages, so we try to cater for their needs. When I'm in a hurry I find it difficult to write concise replies which cover sufficient background for the general reader. 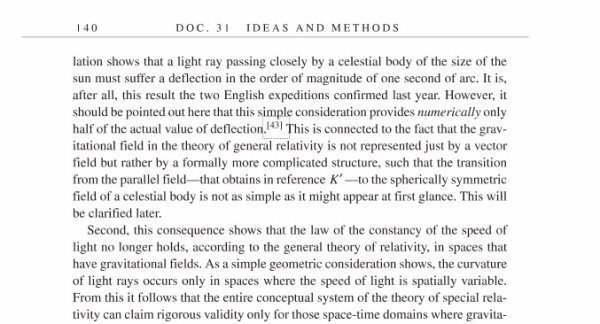 This combined with our use of shortcut-phrases (eg speed of light is constant) instead of the more accurate long form (speed of light in a vacuum is constant for a local observer in an inertial frame) can lead to confusion for the general reader. Some readers might misread this as implying that the speed of light is now constant for the local, inertial observer because and only because of the use of a specific standard for measurement and calibration, rather than because of a physical property of light. "it's nonsense to say that the speed of light is now constant just because the SI definitions of units define its numerical value to be constant." Although this misreading of your post is not an error that would be made by someone well versed in physics, I think you can see that such misunderstandings can arise very easily for the more general reader. Page created in 0.157 seconds with 76 queries.